Hemlock trees tend to be extremely hardy, and few diseases or infections can bring a hemlock tree down. However, there are a few types of diseases of hemlock trees that can destroy entire hemlock stands or even forests if left unchecked. It is vitally important to recognize the signs of these problems early on in order to salvage your hemlock trees' health and vitality. 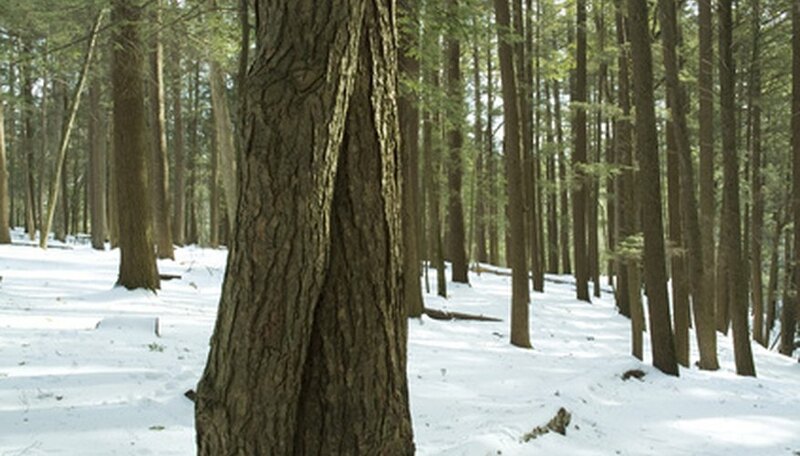 Both powdery mildew and sooty mold present problems for hemlocks. Both forms of infection coat the tree and foliage with a dusty, powdery substance. Powdery mildew may be gray, white or black. Sooty mold is thicker and darker than powdery mildew, and is always black. As the name implies, it makes the tree look as if it is covered in soot. Powdery mildew generally can be controlled by sterile pruning and watering only in the morning to keep the tree from living in too humid of an environment. However, sooty mold will need to be treated with a fungicide and potentially a pesticide as well, since it often follows scale insects, which ooze a sweet substance that the mold feeds on. These cankers can do serious damage to hemlocks if left unchecked. You will first see the formation of a dark bulge around the point of infection. The "wound" may ooze sap and the canker will elongate up and down the branch as the infection spreads. Over time, the bark will become black and disfigured, and you may notice defoliation localized to the area around the canker. To save the tree, you need to use sterile pruning methods to remove the affected area and dispose of the cuttings away from the hemlock tree. This hemlock infection presents a serious threat to hemlock forests as well as individual trees. Left untreated, your hemlock will probably die in four to 10 years as a result of the infection. Woolly adelgid infections are characterized first by tiny, pepper-like bumps on leaves and branches. As the season progresses, these bumps swell and turn gray and fuzzy. As they grow, the hemlock suffers, losing leaves, turning brown and even dropping branches and new growth. Insecticidal soap sprays are a good treatment for this problem, but you must make sure that the tree is fully saturated. Chemical insecticides injected into the ground at the base of the tree are also viable options if you only have one or two infected hemlocks in an isolated area.